Song written by Kate Bush. Originally released on her fourth album The Dreaming. The lyrics concern a smuggler planning his next clandestine journey, Bush takes on the role of his lover, who begs him not to go ('I won't let you do it. If you go, I'll let the law know'). The song ends with the smuggler speaking in defiance ('Would you break even my wings, like a swallow. Let me, let me go'). The song was ultimately released as a single in Ireland, most likely because of the Irish nature of the song, featuring instrumental accompaniment by members of the Irish bands Planxty and the Chieftains. The single was released on 21 November 1983, over a year after the release of the album The Dreaming. The B-side was Houdini. When the single was released, around 1000 copies were made with a picture sleeve; the vinyl 7" was pressed in England (presumably) and the sleeve produced in Ireland. More vinyl was produced than sleeves; because the single did not sell well, by the time the next shipment of 7" singles was in transit the single had already flopped. The surplus discs hung around and from about 1990 copies with a lighterweight sleeve appeared. And so, the original copies had card sleeves whereas later versions had paper sleeves. 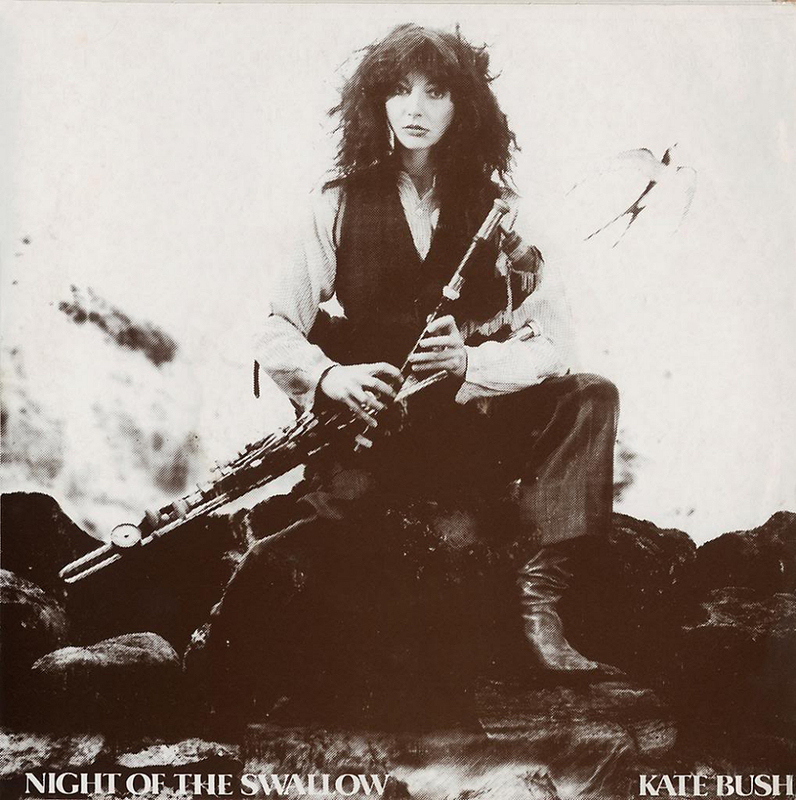 'Night Of The Swallow' was covered by Big City Orchestre, Kat Devlin, Goodknight Productions and The Hounds Of Love. Ever since I heard my first Irish pipe music it has been under my skin, and every time I hear the pipes, it's like someone tossing a stone in my emotional well, sending ripples down my spine. I've wanted to work with Irish music for years, but my writing has never really given me the opportunity of doing so until now. As soon as the song was written, I felt that a ceilidh band would be perfect for the choruses. The verses are about a lady who's trying to keep her man from accepting what seems to be an illegal job. He is a pilot and has been hired to fly some people into another country. No questions are to be asked, and she gets a bad feeling from the situation. But for him, the challenge is almost more exciting than the job itself, and he wants to fly away. As the fiddles, pipes and whistles start up in the choruses, he is explaining how it will be all right. He'll hide the plane high up in the clouds on a night with no moon, and he'll swoop over the water like a swallow. Bill Whelan is the keyboard player with Planxty, and ever since Jay played me an album of theirs I have been a fan. I rang Bill and he tuned into the idea of the arrangement straight away. We sent him a cassette, and a few days later he phoned the studio and said, "Would you like to hear the arrangement I've written?" I said I'd love to, but how? "Well, Liam is with me now, and we could play it over the phone." Night Of The Swallow. Wikipedia, retrieved 18 October 2014.